Set wellbeing goals that build quick wins to improve your levels of energy, resilience, productivity, health, and happiness. Choose a small action each week, day, or month that will make it easier to consistently thrive at work. Have a beautiful wall chart for a visual wellbeing reminder keep you on track each day. 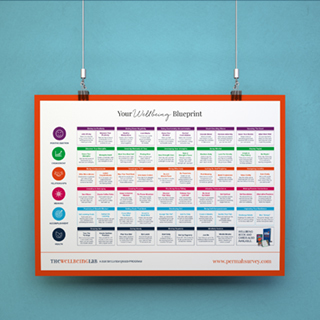 An A1 size with more than 50 interventions included and perfect for to place in the office kitchen, team area, your study or the classroom wall. This is the perfect size to provide a Wellbeing Blueprint map. 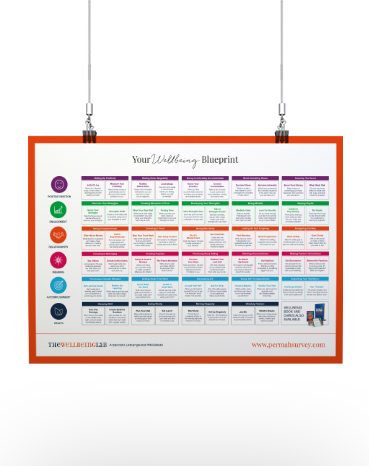 An A3 size with our favorite 25 interventions from the larger poster but easier to print and place on the fridge, in front of your desk or keep in your notebook. This is the perfect size to provide a Wellbeing Blueprint cheat sheet.